Bruce Robert Christopher “Butch” Zubrod age 67, of Cross Plains, passed away on April 10, 2019 surrounded by his family. Butch was born on February 4, 1952 in Hibbing, Minnesota to the late James and Marie Zubrod. After graduating from Riverside High School in Milwaukee, Wisconsin in 1970 he went to work with Barnum and Bailey Circus as a horse trainer and tack repair man for three years. 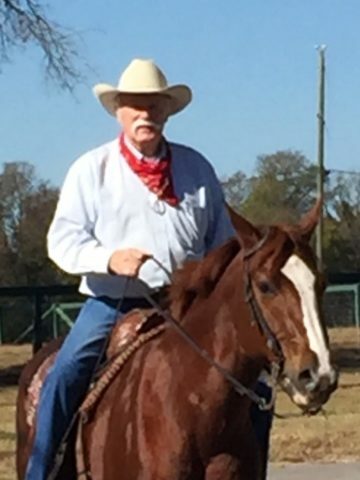 Butch settled in Texas in 1973 where he continued to break wild horses and honed his skills as a saddle maker before moving to Murfreesboro as a horse trainer. In 1978. Butch became a full time saddlemaker with Tennessee Saddlery and in 1989 started Butch’s Custom Saddlery which would eventually bring him Cross Plains in 1999. Butch continued making “saddles, bridles and guitar straps for hillbilly singers” would travel to horse shows in Connecticut, Vermont, and the Hamptons during the summer, and West Palm Beach, FL during the winter. One of the best at his craft, most of his customers just referred to him as the “Saddle Man”. Butch was described as a storyteller and teacher. Chris remembers summer road trips to Texas right before the 4th of July to see his longtime friend, Vince Anderwald. Chris oversaw the map, with Butch calling him the navigator. Knowing he liked numbers, he even had him calculating their miles per gallon during the trip. Chris would direct them making sure his dad took the right exit, even though Butch could drive it with his eyes closed and knew exactly how far they could drive before stopping for gas. These trips during the 90’s are memories that will be cherished forever. Butch is survived by his beloved son, Chris Zubrod; siblings, Jay Zubrod, Brad Zubrod and Sheryl (Vince) Weiler; three nieces and nephews and a host of friends. These arrangements were entrusted to Springfield Memorial Gardens, Funeral Home and Cremation Center 4005 Memorial Blvd, Springfield, TN 37172 615-384-5437 www.SpringfieldFH.com. You are loved and will be missed. You are a genuine friend and I was blessed to be one and have one in you. He is also survived by a daughter Wendy Tepner born May 30 1973, of whom he never met. My condolences to the family.